A Journey by Train Essay. Welcome to our website. This is the one of the best and an unlimited the source of Essay and Paragraph. 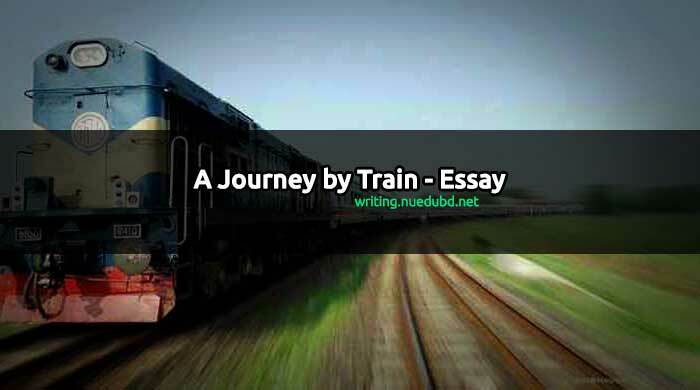 Now NU EDU BD writing section sharing the most useful A Journey by Train Essay for you. I hope you'll like it. Education is one of our basic rights. Now check this out. Introduction: The journey made by a train is called a train journey. It gives us the opportunity to enjoy the beautiful atmosphere of land and rivers. Everybody should make a journey by train for better enjoyment and pleasures. Railway communication in our country: Our country has fair railway communication. Here one can easily go from one place to another by train. Train journey here is comfortable and less risky. It is cheaper too. Last month I got an opportunity to make a journey by rain. The occasion of my journey: Last December I went on a train journey. I was urged by my mother to go to the maternal uncle’s house in Jessore. I along with my sister went there on a sunny day. Beginning of the journey: On the fixed date, we reached Khulna train station in time. We took our necessary things and boarded the train before half an hour of starting the train. I got the ticket and sat near a window. The train was packed and at about 9.30 a.m. the train whistled. At first, the train moved on slowly. But after a few minutes, it began moving at a great speed. It was an express train. Description of the journey: I was traveling in second class. I looked outside the train through the window. The green meadows, fields trees etc.. were sparkling with sunlight. Everything was dazzling when I saw these going backward our train. Our train was passing the bridges and paddy fields. The train was stopping on stations every now and then. The passengers were getting on and down from it. At Noapara station, a deformed passenger got on the train and sat beside me. I was upset about observing his pathetic condition. I was absorbed in deep thought realizing the contrast between the beauty of nature and the deformation of the mortal, My sight-seeing enjoyment got a jerk for a while. However, I talked to this man and understood he was very amusing. I again looked at nature. Everything in nature looked like photos of a film. Everything was beautiful and joyful. The train was passing with whistles stations after stations. I fell into a deep pit of enjoyment. At this state, I could not exactly remember when I fell asleep. When our train reached Jessore station, my sister alarmed me and I was startled. Destination: After three and half an hour the train reached Jessore. I found my cousin waiting at the station. We took our luggage and got down from the station. My cousin welcomed us cordially. Then we hired a rickshaw to reach our uncle’s house. Conclusion: Our journey was an enjoyable one. It was not only thrilling but also sensational. This memory will remain ever fresh in my mind. I think everybody should make the journey by train if he gets chance.